Lost British Landscapes | Unofficial Britain. In September 1931 the trawler Colinda set sail from Lowestoft on a routine trip towards the Leman and Ower Banks some 25 miles off the coast of Norfolk in the Southern North Sea. Her captain wasn’t to know that this trip would spark a train of events that would lead to the discovery of a lost, submerged country. The ship’s captain was the dramatically named Pilgrim E Lockwood. He reported that when hauling their fishing nets in from the area they contained the usual amount of flotsam and debris, lumps of wood, shells, fragments of bone and chunks of compressed peat, which fishermen referred to as moorlog. To the fishermen this was little more than a nuisance. Large chunks of debris often caused damage to their nets, bruised fish and prolonged their working days. It was normal for crews to return such objects back into the sea. Lockwood reported that a large chunk of moorlog was hit by a shovel, in an attempt to break it down for heaving overboard. However this chunk, when hit, sounded different. Lockwood decided to break open the moorlog. Inside was concealed an ancient antler ‘harpoon’. Lockwood had the presence of mind to understand the uniqueness of his find, and after being passed over by the British Museum, the harpoon eventually found its way into the hands of Cambridge biologist, Dr Muir Evans. After some time he bequeathed it to the Castle Museum of Norwich. The harpoon was exhibited at a meeting of the Prehistoric Society of East Anglia in February 1932 and caused some considerable excitement within the archaeological community. The harpoon itself, although extremely elegant, was not an unusual find. There are many of its kind in several other museums. But what made this piece exceptional was where it was found. Even in the early 1930’s rudimentary technology dated the harpoon, more precisely described as a ‘bone point’, to some time in the Mesolithic era and ascribed its origin to the culture of the Magelomose (Danish for ‘big bog’). The mesolithic, dated between 10,000-4,000 BC, was a missing fragment in the chronology of the North Sea. Some years before, in 1913, archaeologist, Clement Reid had written a relatively obscure book about Britain’s Submerged Forests. Around that time, Reid had conducted substantial research in the area around Dogger Bank, (70 miles from the nearest UK coast) and off the coasts of Norfolk, and Cheshire in particular. Reid, now acknowledged as a significant figure in this area of research, posited a radical theory: that there was a significant land mass submerged off the east coast and at various locations around Britain. Over several years Reid had studied archaeological artefacts retrieved by oyster dredgers in the area around the Dogger Bank and, lacking available equipment and resources at the time, was only able to speculatively date and place the finds. This, paired with the fact that trawlermen, by their very nature had not the wherewithal to document or catalogue the sites of these finds, made the task of dating virtually impossible. At best, Reid was working with jumbled assemblages of objects all originating from differing areas and depths of the North Sea, and therefore all from differing periods and scales of climate. Some of his recorded finds included the bones of woolly rhino, which obviously were of considerable antiquity, whereas other finds were relatively recent, such as reindeer and walrus. 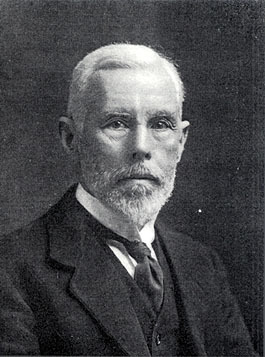 Reid however, was a tenacious character, and he made numerous research trips in the area, even recruiting his wife, Eleanor to help conduct his studies. After some considerable time, he was able to theorise that the discovery of a preserved land mass might be extrapolated across the entire area of the North Sea. This was a radical proposition and his theory caused quite a stir in archaeological, even geological circles. Reid’s proposal was met with scorn and condescension by his peers. His ‘delightful little book’, “Submerged Forests” disappeared into relative obscurity. There are several defining figures in the chronology of research into this area, but fast forwarding to the early 1970’s we come to the work of Dutch archaeologist, Dr Louwe Kooijmans, who documented a collection of bone fragments trawled from the Brown Banks, a series of geological prominences just south of the Leman and Ower find. Kooijmans believed, on the basis of available geological information, that these artefacts inferred a human settlement was more than likely situated on the edge of an ‘inland sea’ (now referred to as the Outer Silver Pit). Moreover he also proposed that tools found in that same location were marginally different to their counterparts found on land. This was an important threshold moment. It suggested that the peoples of the inundated landscape were culturally ‘different’ and should be studied in their own right. There were few developments with this concept in archaeological terms until the late 1990’swhen Professor Bryony Coles of the University of Exeter published her ‘speculative’ survey of this inundated landscape. Coles’ work was groundbreaking. It was a synthesis of all of the available information on the area and even took into account Clement Reid’s early work and research. Coles boldly took the step of naming the lost land, which became known as ‘Doggerland’, perhaps in acknowledgement of Reid’s work around the Dogger Bank. For the first time in over 7,000 years, a lost country found its name and had its own culture. Coles’ paper proved to be hugely influential. It captured the imagination and caused a resurgence of interest in Doggerland as a lost landscape. The archaeological community in particular began to ask pertinent questions about the region and discussed the possibility of further exploration and research. The difficulty is, and always will be, that this submerged terrain is physically difficult to access, being at best some 200 metres and more under the North Sea. Indeed the progressive action of trawlers, encroaching pipelines, soil disposal, wind farming and a host of other activity has muddied the waters, and destroyed potentially valuable artefacts. The retrieval of these artefacts is progressively more difficult and more challenging. Objects relatively close to the sea bed have to some extent been trawled away, some even being sold over the internet. In 2001 the University of Birmingham held its annual seminar on the Mesolithic. Students of the Landscape Archaeology, GIS, and Virtual Environments Masters course convened and began their usual discussions on ancient landscapes. The Leman and Ower bone point had for many years been used as evidence for an ancient landscape but archaeologically there had been little progression since its discovery. 2001 marked a turning point as one of the students, Simon Fitch, chose to do a PhD on the subject. Supported by his supervisor, Prof. Vincent Gaffney and geomorphologist Ken Thompson, the team decided to utilise an unlikely resource to help them investigate the Dogglerland area further. For years, seismic data had been collected, collated, and archived by the oil industry in the North Sea, and might potentially yield useful geological information on the area. After several false starts and with help from the directorate of Petroleum Geo-Services the team eventually managed to access some 6000km2 of seismic reflection data from the Dogger Bank as a pilot study. Work began and, just a few weeks later in Birmingham, an image of a vestigial submerged river, dated at approximately 10,000 years old, flickered across a computer screen. As large as the Rhine, the River Shotton (named after Birmingham based geologist, Fred Shotton) snaked some 40km across the seabed. The reconstruction of Doggerland, Europe’s lost country, was born. As a result of this original and groundbreaking work the Birmingham team founded the North Sea Paleolandscapes Project (NSPP), and tasked themselves with a detailed analysis of Doggerland. Mapping, naming and exploring new territory, its hills, rivers and contours, is always hugely exciting and the team continued its work apace. Much of this research is incredibly detailed and some is as yet unpublished or far too broad in scope to publish in such a short article here. There is still much to discuss and many questions to be answered. How quickly was this landscape inundated? How swiftly did its people make the transition, once their homes and hunter-gatherer lifestyles had been disrupted? It is ironic that even in our time, extreme weather and flooded landscape in particular are playing such a prominent role in our lives in many parts of the countr, as our climate is gradually transforming once again. Yet this is tame in comparison to the scale of deluge of the North Sea. For the inhabitants of Doggerland, the scale and rate of inundation would possibly have been radical and traumatic. Conversely, it has been suggested that inundation may have come about in stages. The land would have gradually succumbed to the encroaching sea over many years and freshwater slowly turned brackish, destroying trees, flora, fauna. Human survival would have been doubtful to say the least. The argument for slow inundation was compelling. Indeed, cursory research into British folklore and mythology suggests a number of mythical landscapes, lost to the waves. For hundreds of years, submerged tracts of forest were known as “Noah’s Woods”, and even Samuel Pepys recorded having seen ancient hazel, preserved in the mud of the Thames. There are folk tales relating to a lost land named Cantre’r Gwaelod (the Lowland Hundred) off the coast of Wales, which might substantiate Girladus Cambrensis’ sightings. This, among numerous mythic islands including Lyonesse, west of Cornwall, Hy Brasil in the west of Ireland, Tir na nog (or St Brendan’s Isle) also off the coast of Ireland and several others. 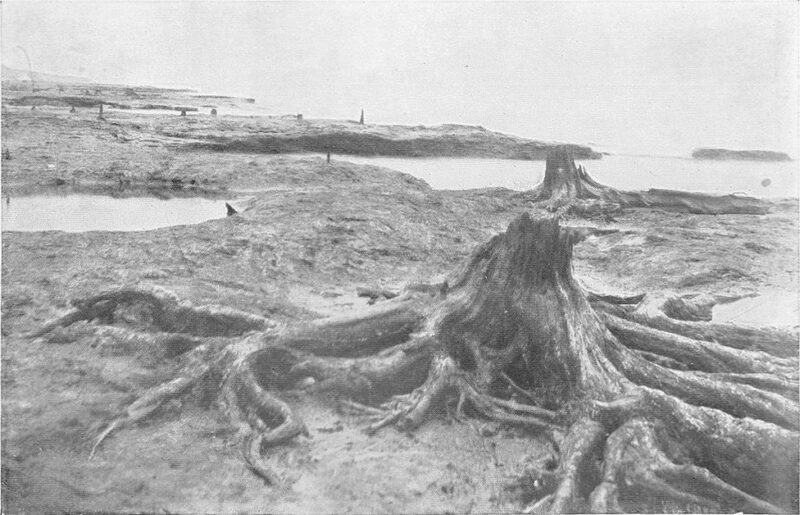 There is physical evidence in the form of fossilised tree stumps at extreme low tide events that ancient landscapes have been submerged in some of these areas. Bathymetric records would appear to confirm that ALL of these mythic islands fall within the area of the continental shelf at specific depths, and may actually have once existed as ‘high points’ in local topography many thousands of years back in a lost epoch. It would not be inconceivable that a vestigial folk memory of these inundated landscapes may have survived the centuries in oral and written records, some perhaps contaminated, transformed over time? Interestingly, most of these folk memories survive predominantly in the west of the country. Why would this be? The continuity of Celtic culture in the west of the country would almost certainly have ensured that folk memory and the myth cycle would be well preserved over time. Surely Doggerland – a huge and indeed significant land-mass, with many hundreds (or even thousands) of inhabitants, would have equally preserved its myths, its folk memory? 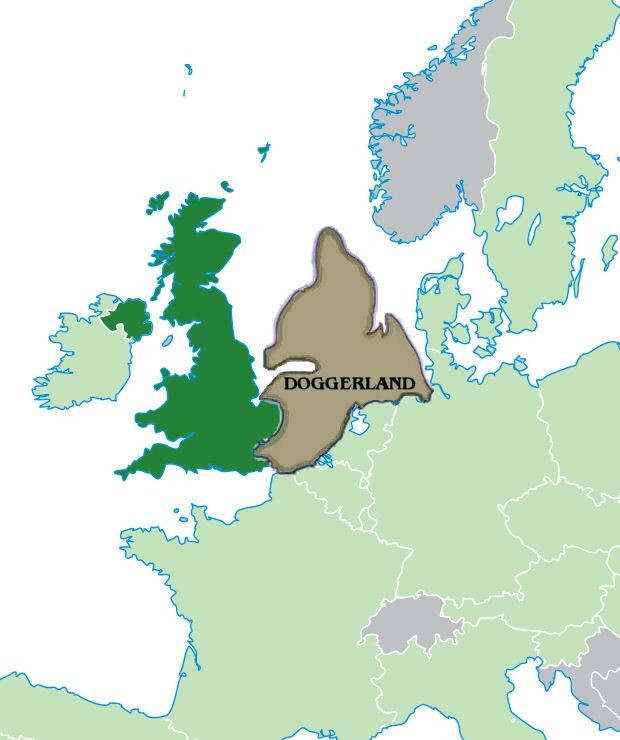 Archaeologists and ethnologists have suggested that Doggerlanders were widely dispersed in a mass diaspora and assimilated into other European (or further) cultures, where all oral recollections were then lost. Others have discussed the possibility that late mediaeval and early Roman invaders wiped out many of the indigenous tribes on the east coast, most of whom would have been descendants of Doggerlanders, keepers of the oral record, thus fragmenting the indigenous myth cycle which subsequently died with them. The other possibility, and to me the most convincing, is that the deluge came rapidly, swamping the east coast like an aquatic Pompeii. Multiple core samples from around the world indicate a great thaw after the last Ice Age. The polar ice caps would have been unlocked and many millions of tonnes of water would have caused a dramatic eustatic shift. Lowlands would have been submerged incredibly quickly. Excavations in Howick, have demonstrated evidence for a massive tsunami from a huge, submarine landslip the size of Scotland, emanating from Storegga, Norway circa 6100BC. Geological evidence suggests that vast swathes of the east coast would have very quickly been deluged, with several immense waves crashing inland at a rate of 20-30 miles per second. Though the area of Doggerland would not have felt the effect of this tsunami quite as dramatically as further north in Northumberland, it would surely have had a devastating effect on its inhabitants, killing many or most almost instantaneously? Sometime around 5500BC, Britain was all but disconnected from the continent. We had become an island nation. Yet it would be incorrect to assume that this separation was the end of Doggerland in its entirety. Doubtless, high points of land, such as the Dogger Bank itself, would still have prevailed as remote islands, and these might possibly have been inhabited. Yet our severance from mainland Europe and Britain would have made social contact, trade, hunting and foraging extremely challenging. Life on these isolated islets would have been tenuous, hazardous and, over time, as the sea rose further, those remaining communities would surely have had to make a final migration towards solid land, or died trying? This would have been a time of significant, and widespread social and environmental change, and with no physical, or written evidence, we can only speculate on the habits, traditions, beliefs and lifestyles of a lost people. Attempting to reconstruct this inundated culture is notoriously difficult, and Doggerland is a place of contradictions. On the one hand, situated as it is, hundreds of metres below the sea, it should be an archaeologically pristine site, a relatively unscathed repository of hidden treasures. It has not been subjected to external degradation by building, for instance, or agriculture, or indeed theft, as so many sites on the mainland have. However, its underwater location is also its downfall. As previously mentioned, beam dredging has, over the last century or so, muddled and destroyed artefacts close to the surface of the seabed, and that, combined with considerable sedimental and alluvial movement and deposition only makes the search for evidence even more difficult. Those material artefacts which have survived for centuries underwater, have done so because they don’t break down, and decompose as rapidly as other organic materials, for example, textiles, animal hides, foliage, wood etc, that would have been invaluable in establishing a more substantial, identifiable basis for human settlements in the area. Doggerland eventually succumbed to the sea, and its remnants, we have established, would have been identifiable only as islands. It is entirely plausible that the Mesolithic inhabitants of Doggerland regarded water in a totally unique manner. This, after all, was the place where the ancestors once dwelt, and the islands may have played a vital role in their ritual or spiritual practice. At times of low tide, these ancestral islands may have been accessible. They might readily or at significant times be revisited and venerated. During the time of the Mesolithic, funerary practices, such as those evidenced in mainland Europe and Russia, were commonplace on islands, which may have served to isolate the dead. The Sami reindeer hunters of Finland inter their dead on islands ostensibly as a protective measure to confine the spirit of the ancestors and prevent them from disturbing the living . Water veneration in the ancient tradition, and even up to the present day is relatively commonplace ( tossing coins into a fountain, baptism, or well dressing are still widespread and prevalent). I have written of Bronze Age cultures, particularly at Flag Fen, Cambridgeshire, and Star Carr in Yorkshire for whom water would appear to have been the locus of some arcane belief system. This we can only surmise on the basis of a body of archaeological and anthropological documentation from related ancient cultures and traditions. The rest is left for the archaeologists of the future, who with the benefit of more advanced technology, material resources and funding, may reveal even more about Doggerland and its people. BG Nichols is the author of a steadily growing body of works that recall “the lost, forgotten, abandoned and mythic” landscapes of Britain. His work encompasses experimental texts, photography and found fragments. Further examples of his works can be found at his website or purchased directly from The Fireside Bookshop, Littlehampton. An art edition, including a floral and faunal reconstruction of the landscapes of Doggerland, and relating to this essay, will be published later this year by Place Editions, in collaboration with visual artist Tracy Hill. Enquiries or further questions , please email whitelineBN @ aol.com or visit his website here for updates. The Storegga slide created a tsunami which it is estimated would have crested at about 5 meters at Orkney, sufficient to have inundated the settlement at Skara Brae but by the time it got to Doggerland it had subsided to a few centimetres. After the initial shock and any after shocks of a tsunami are over sea levels rapidly return to their former level. The circumstances of the submergence of Doggerland are such that over a comparatively short space of time worldwide sea and inland lakes (e.g. Lake Van in Turkey) levels sustained an increase of approx 125 meters that are retained even today. Today I wrote a very brief note of my musings about this which I will be most pleased to forward to Mr. Nichols if he could provide me with his Email address.